She’s just happy to be here. Batgirl #1, by Gail Simone & Ardian Syaf, DC Comics, $2.99, out September 3. 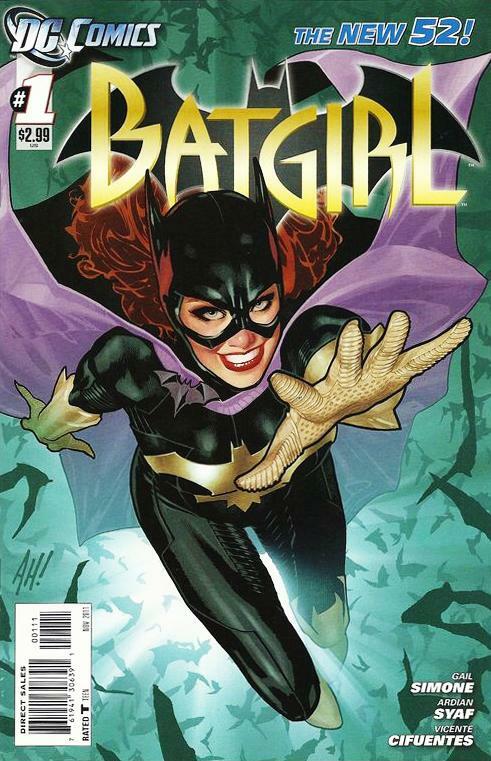 When DC announced its linewide relaunch this September, there were a lot of aspects of this starting-over that troubled some of the preexisting fans, and high on that list was the news that Barbara Gordon was going to be returning as Batgirl. 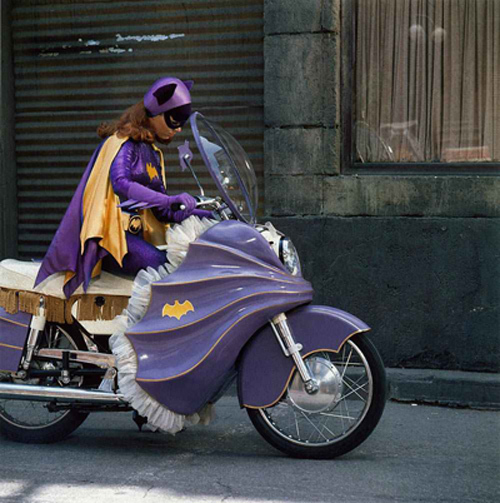 Babs isn’t quite the original Batgirl—there was another Bat-Girl in the 1950s—but she’s the one people remember from the ’60s Batman TV show and comics from the 1966 through 1988. TV Batgirl Yvonne Craig checks herself before she wrecks herself. She was crippled by the Joker in Alan Moore and Brian Bolland’s 1988 graphic novel The Killing Joke, which otherwise wasn’t even about her, and was wheelchair bound from then on. Shortly thereafter other writers turned her into expert computer hacker and information broker Oracle. She organized and led the all-female team Birds of Prey and even led the Justice League from afar for a while. And that was who she was from 1989 through a couple months ago, longer than she’d ever been Batgirl. Oh yeah, and she was on a TV show that way too, but alas, not a good one. In the meantime, other Batgirls arose, first Cassandra Cain and then Stephanie Brown, each with an avid and vocal fan base that didn’t much care for the other. 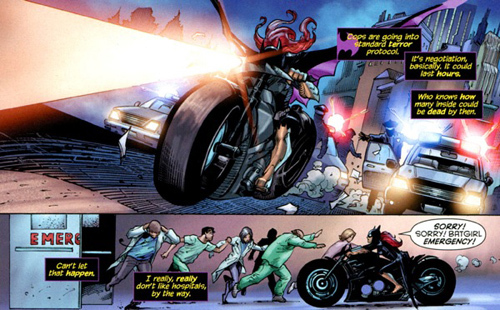 In fact, the Stephanie Brown Batgirl was in the middle of an acclaimed series of her own by Bryan Q. Miller when the news came that she was going to be swept aside for Babs. 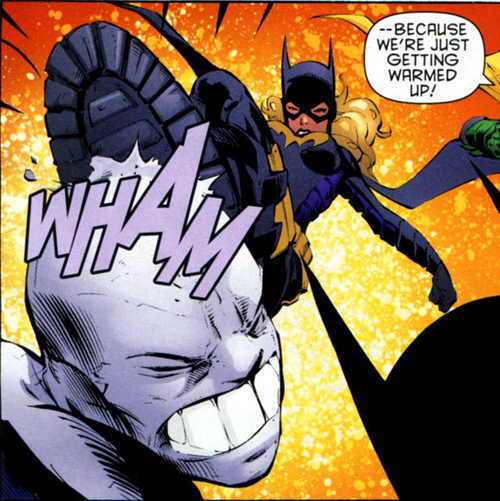 Stephanie Brown: Boot to the head! Whether Cain and Brown even exist in the relaunched continuity is as yet unknown. Apparently Batman has still gone through three different Robins in his newly compressed timeline, but there can be only one Batgirl. 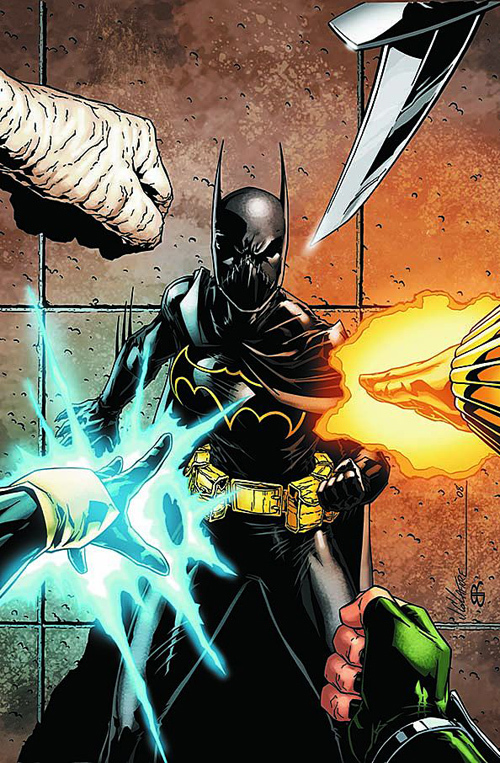 Right before the relaunch, Batman had franchised out his costumed identity into a legion of Batmen called Batman Inc., and if anything it would have made much more sense for Oracle to do the same with Batgirls than it did for him to do it in the first place. So from a knee-jerk perspective, if Babs will forgive the expression, I would have sooner liked to see a Batgirl Inc. than a retro Batgirl. 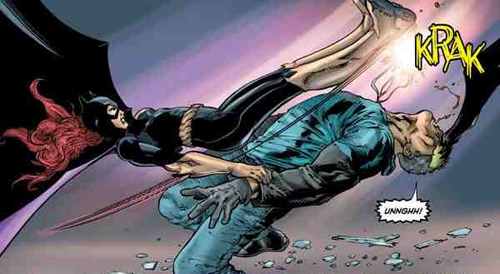 It doesn’t look good for Cassandra Cain. 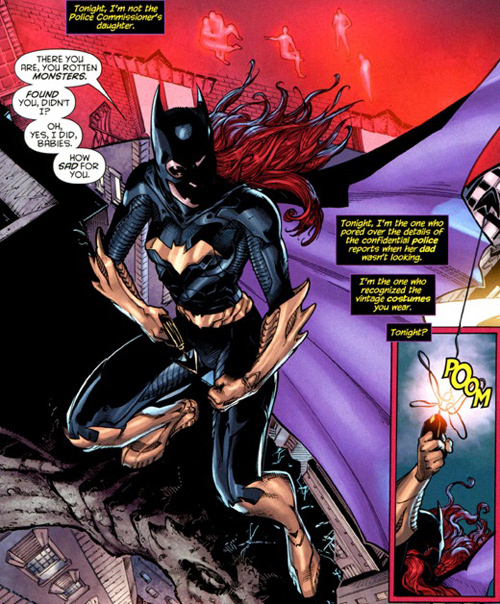 And for Babs, turning her into Batgirl again felt like a demotion. Although what happened to her in The Killing Joke was infuriating in the first place, since then she’d become a much more formidable force in the wheelchair than she’d ever been in tights—and I say that as a big fan of her years as Batgirl. And something terrible happening to her but her using that as an opportunity to become awesome is a much a stronger narrative than something happening to her but she’s all better now and can go out and be awesome again because she can use her legs. That latter scenario sounds more problematic than The Killing Joke was in the first place. Seriously, don’t mess with Oracle. 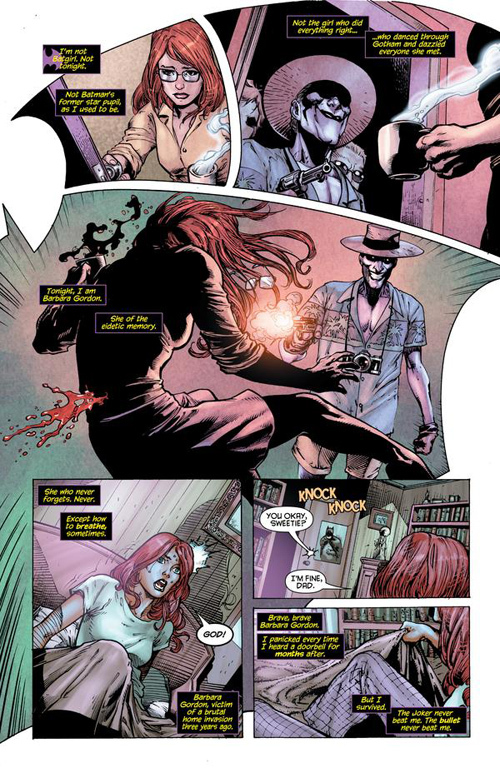 So writer Gail Simone has her work cut out for her in Batgirl #1. 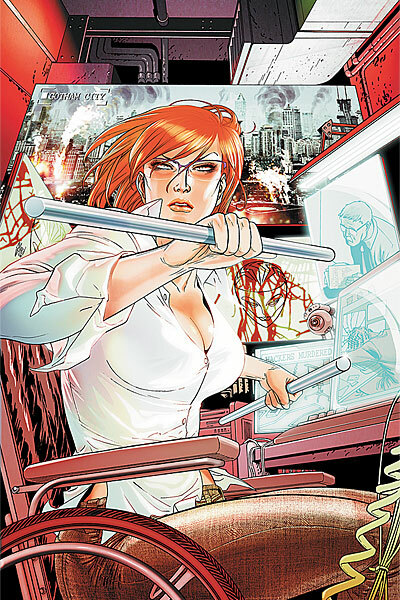 She’d written Babs for years in the series Birds of Prey, the team Oracle founded and led, and in fact her latest run on that comic was one of many cut short by the relaunch. So if anyone knows what’s at stake here, it’s Simone. The idea behind the relaunch is supposed to be to try to attract new readers who don’t even read comic books, let alone DC, and one of the things that’s puzzled me about it is that I don’t think DC knows how to do that anymore. Gone are the days when they could introduce the characters, explain how they got that way in a flashback or well-crafted thought balloon, and tell an actual story all in one comic. And she rides her motorcycle in elevators. Awesome. In fact, so far Batgirl #1 is the first really good comic I’ve read out of the new 52, although to be fair I have many more still to read. As readers of her relaunch-interrupted villain-centered series Secret Six already know, Simone is uncannily good at writing comics that are grim and pervers and fun and lighthearted at the same time, which is very hard to do; in fact I’d say that much of what’s made DC Comics disturbingly gruesome in recent years has been due to writers trying to strike that balance and failing. Simone writes terrific psychotics, and in this issue we have both a mysterious new costumed villain on what appears to be a revenge killing spree and a sadistic crew of home-invasion hobbyists in Halloween costumes. This is juxtaposed beautifully with the sheer sense of joy Barbara Gordon gets from being Batgirl and kicking bad guys in the face. Some bloggers have astutely noted that Batgirl is the only hero smiling on any of the 52 new DC comic covers, and just look at that grin. Babs is loving this, and that too is awesome. I’m not too familiar with Indonesian artist Ardian Syaf, although I guess I’ve seen some of previous work in comics like Batman, Green Lantern Corps, and Birds of Prey. But he’s good. The art is dynamic and full of character, and the Killing Joke flashback is reminiscent of Bolland without going overboard with the mimicry. All in all, I’m glad to have him aboard. I like that she still has photographic memory too, though she probably doesn’t like it right now. 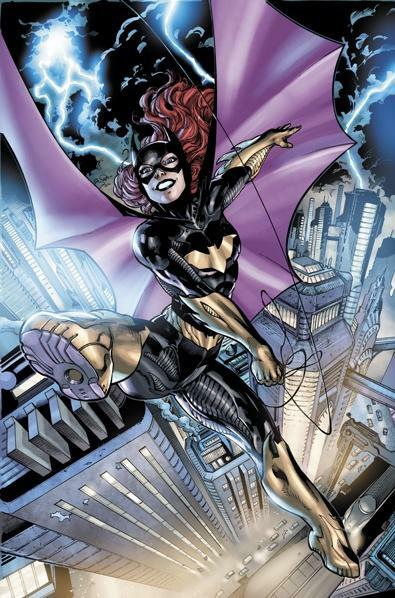 Like most of Jim Lee’s redesigns (I’m assuming Lee did this one like everyone else’s costumes, even though Babs doesn’t have a little Nehru v-collar), I find Batgirl’s new costume a little busy, and I still don’t get how they can all be armored and skintight at the same time, but actually this one I kind of like. It’s reminiscent enough of her old costume for retro appeal, and I like the purple cape interior and stompy boots. I’m not wild about her arms and thighs being ribbed for her pleasure, and her ductile yellow palms look a little too much like kitchen gloves, but overall it’s an appealing costume. Seriously, how can you NOT love her? Unlike the other DC #1s I’ve read so far, this one feels packed with story and character development, introducing new characters and really feeling like a new beginning for Batgirl rather than walking into a story already in progress where suddenly everything’s different and nobody’s telling you how or why. From a fan standpoint, it’s a little more problematic. 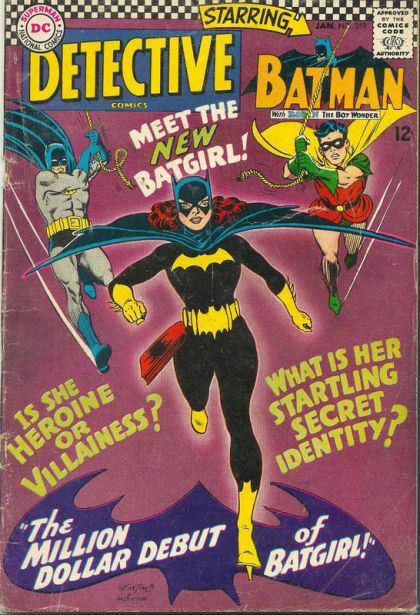 In this issue we find out that Babs was still shot just like she was in The Killing Joke, but after that it gets hazy. “For three years, I couldn’t move or feel my legs. Then a miracle happened.” That’s all we get on that subject for now. There’s a strong sense of how haunted she is by the experience, but not what she did for those three years (nor why it is that she can walk again). If the implication is that she never became Oracle, it feels like taking all the bad of what happened in the old history and none of the good. What she did in her time in the wheelchair is an important thing to know, because as awful and infuriating as what happened to her was at the time, she became a tremendously capable role model for not letting physical limitations hold her back. (A role model now lacking in the brave new world of DC.) I’m happy for her that she regained use of her legs somehow, but it’s important to understand that it wouldn’t be any less all right if she hadn’t, that she could and would still be a hero, even a stronger one. And the thing is, I know Simone gets that. 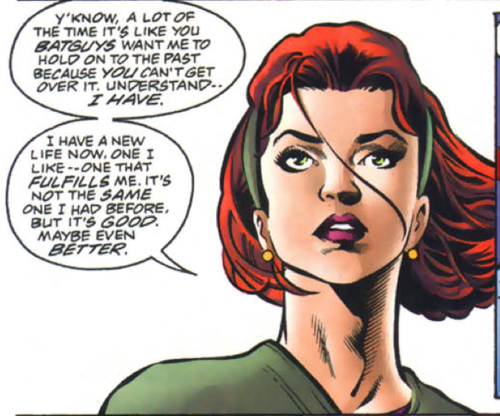 She wrote Barbara Gordon as Oracle for a long time, and showed a tremendous understanding of her character. I know also that she’s very cognizent of the issues involved, and has been more than willing to engage in conversations with concerned fans about the thorny issues raised by putting Babs back in the batsuit. So I trust her enough to know that this is just the barest beginning of the story, and that this initial impression that Babs spent her three years in the chair entirely out of action can’t be right. 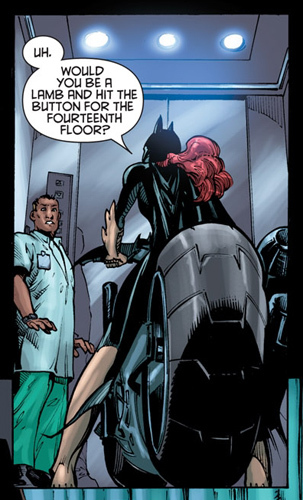 It’s not like Barbara Gordon to wait around for a miracle and spring back into action only when and if it happens. She’s much stronger than that, and it’s important for a lot of people that she’s stronger than that, so I trust it’ll be addressed somehow. In the meantime I’m more than willing to wait and see, because as I may have mentioned, just as a read unto itself it’s a thoroughly enjoyable comic book.